Not Compatible with Netflix, Amazon Video,HBO go, and Honda motor.Share videos & slideshows on the big high definition screen with your family and friends right now! Support transmit the Video and Audio to HD TV or HDMI device. Easily plug and play, no jailbreak needed. This product is suitable with iPhone display devices. iPhone with Personal hotspot and lightning iPhone 5 / 5C / 5S iPhone 6 / 6 Plus iPhone 6S / 6S Plus Compatible iPad mini 2 / 3 / 4 iPad air 2 / 3 / 4 / 5 New iPad iPad Pro Features 1. Support iPhone audio/video signal convert into HD digtal singal to alI TVs with HDMI ports. 2. Resolution: 480p, 720p, 1080p 3. Support all formats of audio and video 4. Plug and Play, easy to use If for any reason you are not satisfied, please do not hesitate to contact us or Amazon customer service. We will try our best to make it right for you ASAP. We only guarantee products offered by PIN YUAN. 1.Please make sure of right adapter(5V/1A),5W for iPhone,10W/12W for iPad.iPhone/iPad original adapters are the best choices.If lower voltage,it will not work very well. 2.Due to copyright protection measures,you may not use multi-screen mirroring with some paid contents including Netflix, HULU, Prime videos, directv and other paid videos,please refer to the terms and conditions of those apps. 3.This iPhone HDMI CABLE adapter isn't designed for charging purposes. 4.Only can connect the device which has HDMI interface. 5.Only can connect the device which has HDMI interface, do not connect computer or laptop or tablet. 6.It works in full screen if the screen is within 70 inches, otherwise it won't. 7.It may show" not support this accessory" after you click "trust",please click close and wait ten seconds then it's OK.
Not Compatible with Netflix, Amazon Video,HBO go, and Honda motor!!!!!! LIGHTNING DIGITAL AV CABLE supports mirroring of what is displayed on your device screen - including apps, presentations, websites, slideshows and more - to your HDMI-equipped TV, display, projector or other compatible display in up to 1080p HD. 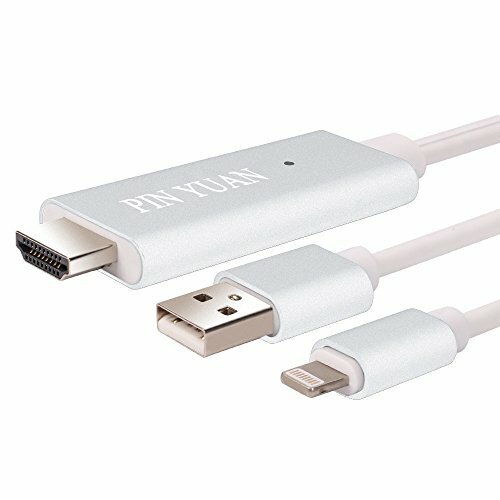 This iPhone HDMI CABLE adapter isn't designed for charging purposes.Only can connect the device which has HDMI interface, do not connect computer or laptop or tablet. If you have any questions about this product by Pin Yuan, contact us by completing and submitting the form below. If you are looking for a specif part number, please include it with your message.